Recently, …….., the Oconee River Boys were recognized and a display was installed at the Georgia Music Hall of Fame in Macon. In the 40’s and early 50’s, when we were growing up, we did not have Telephones or televisions in many areas of Oconee County. Radios were the source of information and entertainment. Athens Radio Station, WRFC, 960 AM, was a mainstay. It played most of the day in our house. Daddy even had a radio at the milk barn. I remember hearing much news, music and “mystery” and “cowboy” shows on that radio. The Chuck Wagon Gang with Red Healan was on at 10:00 AM on weekdays. My mother did not miss that program. It was part of my life and that of many more people. My wife has often commented on the singing and musical abilities of her relatives in the Pritchett family. She is quick to say that she did not get that talent and cannot “carry a tune”. Over the last 40 years, I have interacted with many of her relatives and have heard them sing and play. They are talented. Another Pritchett characteristic is the tendency and ability to tell jokes, laugh and be humorous. Betty did inherit the ability to laugh and be friendly. Betty’s father was a younger sibling and Betty was the youngest of her father’s children. (Her brother says he can’t sing either!). Because of the time of births, many of Betty’s first cousins are significantly older. Some of their children are almost Betty’s age. Her first cousin, Horace Arthur, can “crack a joke” at the drop of a hat. James Pritchett (Jim- another first cousin) can do it too. Both have musical ability and I have heard them play and sing over the years. 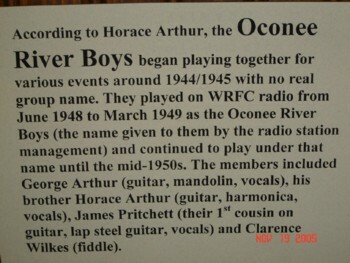 A couple years ago, at Horace and Trellie’s Golden Wedding Anniversary celebration at the Civic Center, we saw a report and music about the Oconee River Boys. 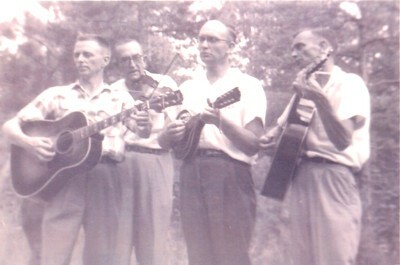 Horace and Jim along with George Arthur, (Horace’s brother and Jim’s cousin) were three of the four participants in the Oconee River Boys. Clarence Wilkes was the other member. Also, there was duo, Pee Wee and Peggy, who sang with the Oconee River Boys and performed on WRFC. Peggy was Jim Pritchett’s wife and Pee Wee Pruett was her brother. Recently, with the initiative of Wanda Arthur, Horace’s eldest daughter, the Oconee River Boys were recognized and a display was installed at the Georgia Music Hall of Fame in Macon. 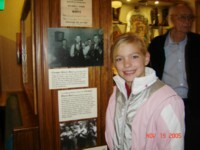 On November 19, 2005, Horace, Trellie, Wanda, Jim’s son, Tim Pritchett, and others visited the Music Hall of Fame in Macon. They have provided some pictures of the visit. Horace Arthur and Joseph Johnson, Curator, at GA Music Hall of Fame Display – Oconee River Boys.